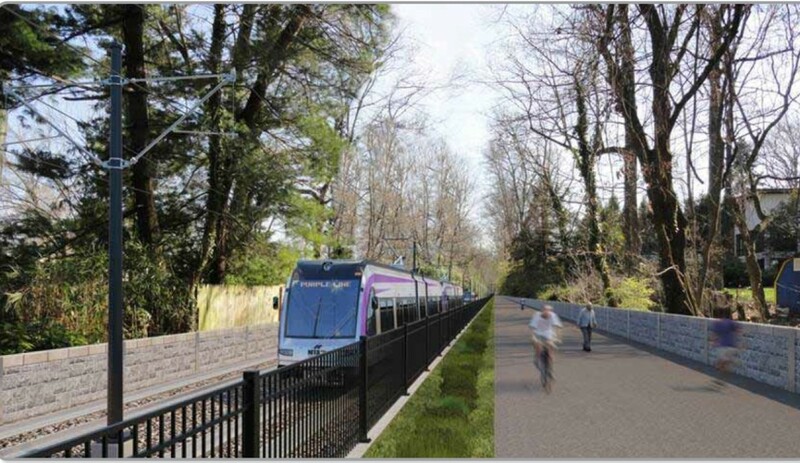 Artist rendering above: Purple Line trains plan to run along Capital Crescent Trail. Editor’s Note: This is the second of two stories about whether Gov.-elect Larry Hogan will choose to move forward on one of the most major transportation projects being proposed in the state, the 16-mile light rail Purple Line in Prince George’s and Montgomery counties. Our first piece examined the benefits to the project; this story examines some of the concerns with the $2.4 billion proposal. Moving forward on the Purple Line would be a major financial commitment for Republican Gov.-elect Larry Hogan, who has at times been harshly critical of the project. Hogan has not decided if he will support its construction, and has somewhat tempered his criticism. Yesterday he appointed as his transportation secretary Peter Rahn, former head of transportation for the states of Missouri and New Mexico. Hogan pointed out that Rahn’s reputation as a highway builder was a factor in his selection. To help pay for the $2.4 billion project, Maryland officials are expecting the federal government to contribute $900 million in federal transportation grants over a period of nine years beginning in 2015. However, none of the federal dollars are guaranteed until a multi-year funding contract is signed off on between state and federal officials. That is slated to occur this spring, after the state has selected its private project partner to help design and build, then operate and maintain the Purple Line. The balance — $1.5 billion — would be covered using approximately $711 million in allocated state funds, a private project partner that would finance up to $900 million for the state, and Montgomery and Prince George’s counties that would each kick in $120 million. The project’s cost has increased nearly $300 million since November 2012, according to Federal Transportation Administration reports. Henry Kay, executive director for Transit Development and Delivery for the Maryland Transit Administration (MTA), said increased property values and interest on financing drove the cost upwards. Many believe the cost could still increase. To date, the state has invested $187 million on the project for planning including evaluating alternative paths, engineering and buying rights of way, according to MTA. Questions persist about projected ridership numbers that, among other things, will forecast projected revenues that the state will need to cover some of the long-term operating costs of the project. To date, fares have not been determined, but Kay said the state is considering a range that would be between Metrobus and Metrorail fares. The state debt level could be affected by the private financing. DLS analysts indicate MDOT has stated the debt incurred by private financing to construct the Purple Line should be categorized as non-traditional debt (as opposed to state tax-supported debt) because Purple Line fare revenues would be pledged to the 30-year debt service payments, and if the revenues can’t cover the debt payments, then all MTA fares would be pledged. Residents and businesses will be displaced. Fifty-six residences and 88 businesses will need to move, Kay said. Any relocation by the state would trigger relocation benefits, and if the state cannot reach amicable settlement with property owners, it has the option to use eminent domain. Building the Purple Line is an “environmental disaster,” Hogan has said, according to an Oct. 16 fact sheet. A Montgomery County non-profit group filed suit against the Federal Transit Administration, the U.S. Fish and Wildlife Service and the Secretaries of Interior and Transportation last August. Natural habitats in the Rock Creek watershed would be disrupted, nearly 50 acres of trees would be cleared on the Capital Crescent Trail hiker/biker trail and noise and vibrations from the train are concerns. In this artist rendering, a proposed Purple Line train arrives at the Riverdale Park station. Sen. Richard Madaleno, D-Montgomery, the new vice-chair of the Budget and Taxation Committee, considers himself a “skeptic” when it comes to the Purple Line. When asked if he considered the Purple Line a priority project for the state or one that could wait, he said he just didn’t know if the economics of the project would work any longer. Madaleno also said he tried to gain “additional information” on the financing plans, but MTA officials first asked him to sign a confidentiality agreement. Madaleno said he was hesitant to sign it and didn’t. Referencing Barry Rascovar’s Maryland Reporter column, Madaleno said he disagreed that traffic would be taken off the beltway. David Lublin, the former mayor of Chevy Chase and chief blogger of Seventh State, has done a series on the Purple Line called, “The Giant Purple Credit Card.” Lublin said there are multiple cons to building the Purple Line. Purple Line studies indicate only 11% of residents within the proposed corridor currently use public transportation. Kay said once the Purple Line is in use, that percentage is not likely to go up that much.